Smiles are a reflection of happiness! And we strive to make those smiles perfect! Isha Multispeciality Hospital’s Department of Dentistry endeavours to impart specialized and expert dental healthcare and also educates the patients about its importance. 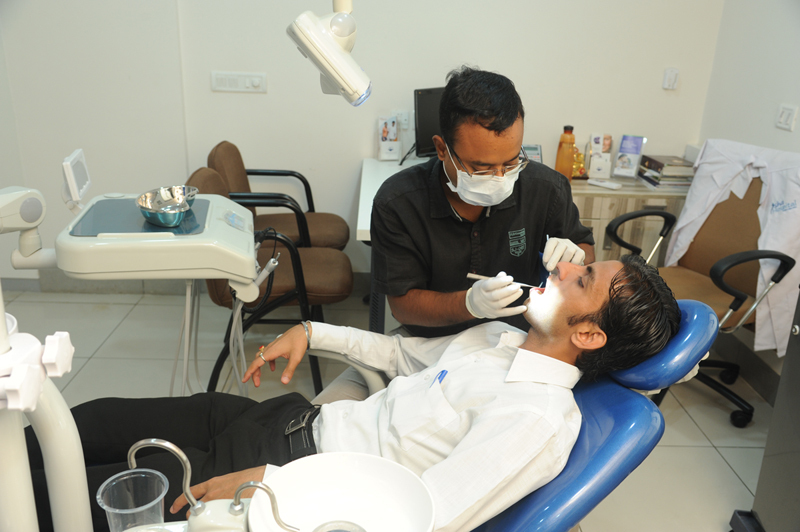 Well-equipped with latest technology, Isha ensures high standards of personalized dental care. Isha Multispeciality Hospital’s Dentistry department encompasses almost every service in the field and is a multi-speciality department in itself. Orthodontics is the branch of dentistry that is related to alignment of teeth & smile designing and is concerned with the treatment of improper bites, and crooked teeth. Orthodontic treatment also deals with correction of jaw discrepancies. We, at Isha, possess unique treatment prediction software that enables the patients to view what changes the orthodontic treatment would bring in their face, even before the treatment is commenced. The types of orthodontic treatments provided are fixed orthodontic treatment and removable orthodontic treatment. The types of braces are metal braces, clear braces, invisible braces and self-legating braces. Orthognathic surgery is the procedure to correct conditions of the jaw and face, related to structure, growth, sleep apnea, TMJ disorders, malocclusion problems owing to skeletal disharmonies, or other orthodontic problems that cannot be easily treated with braces. Bones can be cut and re-aligned, then held in place with either screws or plates. It is also used in treatment of congenital conditions like cleft palate. This branch of dentistry basically deals with conservation of the tooth, thus helping to preserve the natural dentition of the patient. Conservative dentistry includes cosmetic dentistry, tooth colored fillings, bleaching, porcelain/ ceramic veneers, aesthetic full ceramic crowns, tooth jewellery and many more services. Endodontic treatment is rendered in teeth having pulp diseases. Every attempt is made to save all the badly mutilated teeth, irrespective of the age of the patient, bringing them back to normal function and aesthetics. Root Canal Treatment is a part of Endodontics, which includes machine-assisted root canals with disposable instruments, dental operating microscope and re-root canals. The process includes the removal of the tooth’s pulp, a small, thread-like tissue in the centre of the tooth. After the damaged, diseased or dead pulp is removed; the remaining space is cleaned, shaped and filled. Some cases require advanced treatment procedures like complicated RCTs, Hemisection, Radisectomy, Apicectomy Splinting, etc. Excellent provision for all these procedures is available. Cosmetic dentistry helps you with a smile makeover and includes correction of chipped, stained & spaced teeth. Tooth coloured filling is a speciality of the department, wherein a filling replaces part of a tooth that has been lost because of decay or accidental damage. The teeth whitening process or dental bleaching work wonders; because we are experts in all facets of cosmetic dentistry, we can determine which technique will best suit your individual whitening needs. Dental jewellery (skyce tooth jewels) offered by us is made and certified in the EU, and is available in two colors, crystal and sapphire blue. Prosthodontics is a branch related to replacement of teeth. Fixed replacement of lost teeth also falls under this category. It includes dentures – full & partial, removable & fixed, as well as implants. Dentures can be categorised into removable and fixed dentures. The removable dentures can be either complete or partial denture, while fixed denture is called crown and bridge. Dental implants are the most advanced type of fixtures. It can be used for single or multiple missing teeth. Titanium screws are surgically incorporated in the alveolar bone, with extensions in oral cavity for receiving the artificial tooth form. Dental Crowns or Teeth Crowns are dental restorations which are fitted on a portion of tooth lying above the gums. When teeth are heavily decayed, they may be too weak to survive with just a filling. By placing a crown, a tooth may be given a new lease of life. In this way, the dental crown acts like an external surface of the tooth, giving it required protection and good appearance. Dental bridges can be supported by either natural teeth or implants. It can be made from metal, alloys, porcelain, or a combination of these materials. Periodontics is a branch related to gum diseases and their treatment along with surgical replacement of lost bone. Periodontics helps in maintaining oral hygiene. If detected early, periodontal diseases can be treated through non-surgical procedures such as scaling and root planning. Pyorrhea is an advanced stage of periodontal disease, in which the ligaments and bones that support the teeth become inflamed and infected. At Isha, treatment of pyorrhoea is accomplished through gum surgery, in which the infected tissue and tooth deposits are removed and artificial bone is filled in areas of bone loss. This treatment is carried out under special settings by proficient specialists. This is a particular branch related to extraction of teeth and other surgical procedures. Oral and maxillofacial surgery is a surgical process to treat many diseases, injuries and defects in the head, neck, face, jaws and the hard and soft tissues of the oral (mouth) and maxillofacial (jaws and face) region. It is an internationally recognized surgical speciality. Third molar, also known as wisdom tooth, usually appears at the age of 17 to 25. Third molars become impacted or ’come in sideways’. They are often extracted when this occurs. Impacted wisdom teeth (i.e. those that have failed to erupt through the gum) fall into one of several categories: mesioangular, vertical, horizontal and distoangular. A cyst is a closed sac, having a distinct membrane and division, from the nearby tissue. It may contain air, fluid or semi-solid material. A collection of pus is called an abscess, not a cyst. Generally, cysts are diagnosed by X-rays, but may require biopsy, in which a small tissue is sent for examination to a pathologist or by taking fluid from the cyst and sending to the pathologist for examination. Removal of the entire cyst with closure or cavity packed open; decompression of the cystic cavity by making a small opening and evacuating the cystic content. Temporomandibular joint disorder (TMD, in the medical literature) is an umbrella term covering acute or chronic pain, especially in the muscles used for chewing and/or inflammation of the temporomandibular joint (the joint connecting the lower jaw to the skull). The primary cause is muscular hyper- or parafunction, as in the case of clenching, with secondary effects on the oral musculoskeletal system. TMD splints made of soft and transparent plastic; are widely used in sports. They allow the muscles and ligaments to relax, therefore ridding the facial muscles of the tension and tightness that bruxism, clenching, or other jaw problems may cause. Further, dental treatment should be avoided until the symptoms resolve. Managing children on the dental chair is a specialized task which involves scientifically proven techniques. At Isha’s Department of Dentistry, we have a panel of Pedodontists (dentists who specialize in treating children) to ensure that children receive the best dental care they need. This is done through special behaviour management techniques which involve motivating the child for dental treatment and eliminating unreasonable fear of the dentist’s chair. The service is well-supported by the most modern operating instruments and state-of-the-art operation theatres. The equipments are kept updated with the advent of new technologies. The increasing technology improvement applied to software for the diagnosis, treatment and prediction in Orthodontics makes it more precise and efficient. The Department of Dentistry at ISHA Multispeciality hospital boasts of the latest technology and software, which help the specialists to maintain high standards of excellence and efficiency.